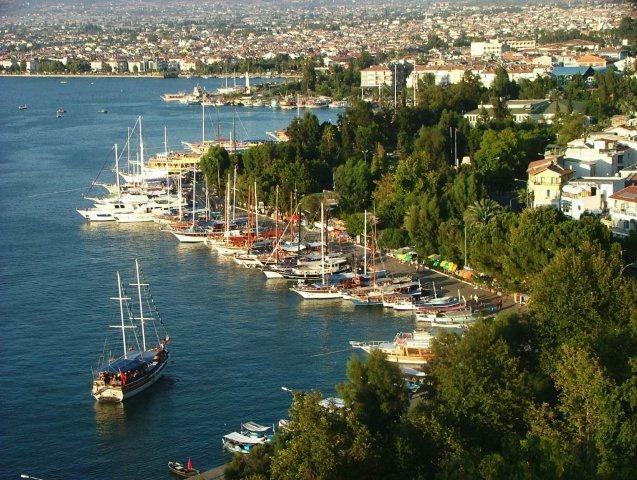 Fethiye, the nearest major town and port to Ozturk Hotel, is 15 minutes away by taxi or dolmus. It is one of the Turkish resorts enjoying a naturally beautiful location surrounded by mountains with a typically Mediterranean feel. Telmessos, on a boat at sunset you will notice how picturesque the place is. Watch out for the tomb of King Amyntas and the antique theater, remains of the Lycian civilization. 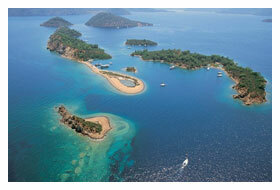 The Fethiye Bay is the ideal and very popular spot for yachting holidays in and around the 12 Islands. The town offers many restaurants, bars and evening entertainment. Paspatur, the old town, is well worth a visit with its nice little shops and narrow streets for pedestrians only. Taking a walk along the sea side promenade and enjoying the sight of wooden gullets and fishing boats whilst having a drink is always a nice memory to take back home. Calis is the nearest beach to Fethiye and famous for its sunset. Only 10 minutes away from our hotel by mini bus, stands a stunningly beautiful Oludeniz Lagoon offering crystal clear turquoise waters and a long sand-and-pebble beach, Belcekiz Beach. There are small shops, restaurants, bars and cafes alongside the beach. Water & fun sports such as parasailing are on offer for those who like to be more active. Paragliders who have started at the heights of 2000 meters high Mount Babadag usually end their trip at Ölüdeniz, creating an attractive sight like a parade of colorful butterflies as they land. Boat tours to Gemiler Island and the interesting Butterfly Valley start from the Belcekiz Beach. Lively and busy day and night, Hisaronu is the name of the village where we are located and can be reached by foot from Ozturk Hotel. Gift shops, ATM machines(24 hr. ), markets, pharmacy and travel agencies stay open until very late.The place turns into the major entertainment center of the area with the sound of music and crowds, coming from bars and specialty restaurants on the main street. And the night life goes on in Hisaronu until sunrise. Once a Greek village, Kaya ( or Kayaköy ) today consists of a valley with some carefully restored Greek stone houses, natural pathways, typical teahouses, restaurants and lots of nature. The unique atmosphere here catches the visitor instantly especially with the sight of the former Greek town Levissi leaning and rising alongside a hill. A stroll before the sunset inside the tiny streets of Levissi and around the once existing houses, churches and village shops takes one back in time and is a wonderful experience. 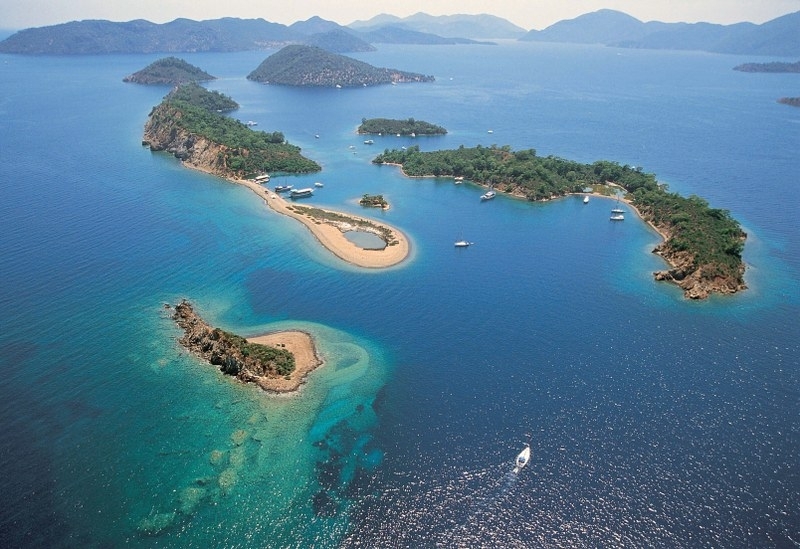 Along the southwestern coast of Turkey lie 12 Islands hidden in the scenic Fethiye Bay. Mediterranean pine forests and great Taurus Mountains reach down and touch the turquoise of the crystal clear blue waters in hundreds of secluded coves. Gocek, a small and friendly village conveniently located 30 minutes away from the international airport of Dalaman on the road to Fethiye, is the major spot for yachting holidays due to its natural harbor facilities and central positioning on the coastline.Kas is an interesting resort town to the south of Fethiye ( 90 minutes by car ) full of history and culture. A stroll in the town center and a pause near the marina during the sunset are recommended. Marmaris,is the oldest tourism center in the area and a major resort town sheltered in a splendid bay. Rich in nature and popular with its modern marina, Marmaris offers variety of shops, bars and restaurants along with luxury accommodation through chain resort hotels. Dalyan, within 2 hours of car drive from Ozturk Hotel, is a resort town popular with its protected natural sandy beach where “Carretta Carretta” sea turtles lay their eggs yearly. Dalyan is also famous with its mud bathing facilities and antique site of Caunos. 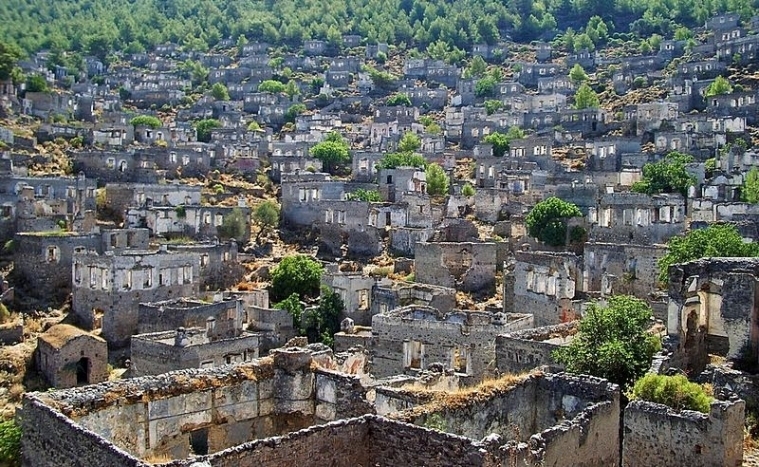 Kas, is an interesting resort town to the south of Fethiye ( 90 minutes by car ) full of history and culture. A stroll in the town center and a pause near the marina during the sunset are recommended. Kalkan, a typical Mediterranean coastal village with its tiny marina and charming small bay, is on the way from Fethiye to Kas. Reachable within 90 minutes, Kalkan is also located 15 minutes away from Patara’s antique site and virgin 17 km. fine sand beach. 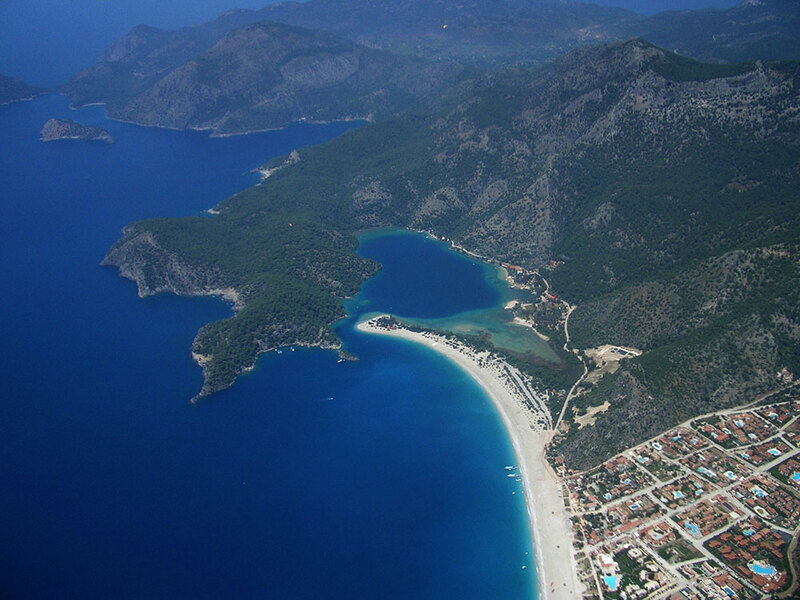 Fethiye, benefits from the typical Mediterranean climate: hot and dry in summer, warm and rainy in winter. As the global weather also shows some irregularities lately, exceptions may occur in our region too. Nevertheless, the weather in July & August is always hot and dry. During June & September, one can expect very pleasant evenings and milder temperatures. Occasional rain showers, winds and cooler evenings are the characteristics of the season. Sea temperatures however always stay above the comfort level.